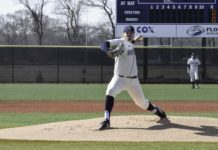 The University of Rhode Island baseball team (10-10) traveled to Davidson, North Carolina where they faced the Davidson College Wildcats in their opening Atlantic 10 conference series, sweeping them 5-2, 7-6 and 9-1 to extend their four-game winning streak. In the first game, the Rams opened up an early 1-0 lead in the top of the second inning when sophomore Brett McManus hit an RBI double down the line to bring home redshirt senior Mike Corin. URI would add another two runs to their lead in the following inning when senior Martin Figueroa hit an RBI single that brought in redshirt junior Chris Hess. Figueroa later crossed home plate following a sacrifice fly off the bat of redshirt senior Matt O’Neil. Davidson made the game close in the seventh inning, scoring two consecutive runs to make it 3-2. Sophomore Kevin Heiss would steal third and eventually score on the play after a wild throw from the Wildcats catcher in the top of the eighth. Figueroa would score an insurance run immediately after on a Jordan Powell single to bring the score to its final of 5-2. Junior pitcher Nick Johnson (1-2) enjoyed a solid outing on the mound, allowing two runs in 6.2 innings of work and he struck out five en route to picking up his first victory of the season. Redshirt senior Blaise Whitman earned his first career save when he struck out three over 2.1 innings of relief. URI’s second game was an intense back-and-forth contest against a team looking to avenge its loss from the A-10 Championship last season. The Rams began the game with a comfortable 3-0 lead in the top of the second inning. McManus and Junior Mike Foley both had RBIs while Heiss laid down a sacrifice bunt to score McManus for the third run. Figeueroa tacked on another run in the next inning after smashing a solo home run over the right-centerfield wall. Powell singled home Foley in the fifth to extend the lead to 5-0. The Wildcats showed signs of life in the bottom of the fifth, getting on the board with their first run before adding three more runs the next inning. 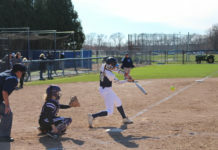 In the bottom of the seventh, with the score 5-4 in favor of URI, the Wildcats took their first lead of the game when Will Robertson hit a two-out, two-run homerun to make the score 6-5. 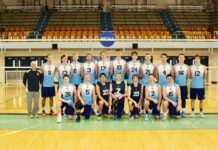 The pressure was firmly on Rhode Island, as they saw what looked like a certain victory slipping away. URI, however, found their hero just as the game was nearing its thrilling conclusion. Corin, who was eventually named the A-10 Player of the Week, stepped up to the plate in the top of the ninth inning and responded to the Wildcats comeback effort with a two-run shot of his own– taking back the lead for his Rams, 7-6. The drama spilled over into the bottom half of the inning, Redshirt senior Jesse Lee caught a fly ball and threw out Davidson’s Cam Johnson at home plate for the game-ending double play. Sophomore Mark Silvestri earned his first win of the season following a scoreless eighth inning. redshirt junior Tyler Barss earned his fifth save of the season and redshirt junior and the game’s starter Matt Murphy pitched five innings for a no-decision. Murphy retired 12 straight Davidson batters from the first to the fifth inning. Cerrato was ecstatic with his team’s performance in their second win of the weekend, while also giving credit to Corin for earning conference recognition. Rhode Island completed the sweep in the third and final game of the series. They built what turned out to be an insurmountable lead following a five-run first inning. Figueroa started the scoring with an RBI double, before Corin continued his weekend senior heroics with a grand slam, his second home run of the series. The Rams stayed red hot, scoring two more runs in the second, and then one run a piece in the top of the fourth and fifth innings for a commanding 9-0 lead. Davidson would score their only run of the game in the bottom half of the ninth inning to avoid Rhody shut out. Rams freshman Vitaly Jangols earned his third win in his first career start, pitching five innings and allowing just one hit, which came from the leadoff batter Cam Johnson. The Rams had a dominant performance from their pitching staff to end the series with four pitchers combining to allow just four hits; Jangols, freshman Nick Robinson, redshirt sophomore Cam LeFleur and junior Andrew Veiga. Cerrato expressed his confidence and satisfaction in Jangols and the rest of the pitching staff. “Vitaly Jangols was good for us this weekend, the bullpen was good for the most part, only a couple mistake pitches but other than that they did a nice job,” Cerrato said. The Rams will hope that the solid pitching is a sign of more good things to come, especially since the status of junior ace Tyler Wilson is in serious doubt following a shoulder injury he suffered earlier in the month. Cerrato says the team is awaiting on a second opinion for confirmation. Rhode Island visited Northeastern University yesterday and prevailed 7-3 for their fifth straight win. The Rams built a 7-0 lead after three innings, and would not need any more with the Wildcat offense kept in check for most of the afternoon. 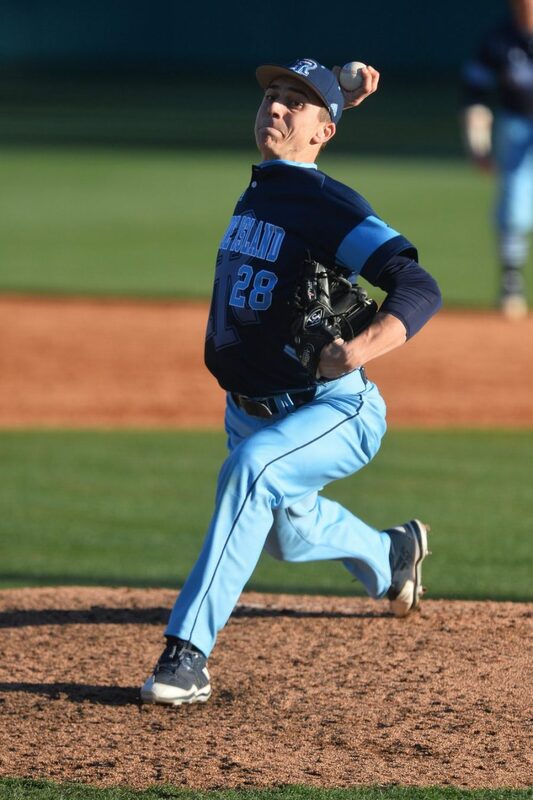 URI did not uses a pitcher above two innings but gave up just six hits and struck out 15. Heiss and O’Neil each two RBIs. The team returns home for the next four games starting with a game against Quinnipiac University and followed by a three-game series against St. Louis University. Cerrato and his team are excited to reach a point in their schedule where they get to take advantage of some mid-week games, and compete in the comfort of their home field.